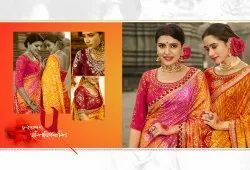 Manufacturer of a wide range of products which include sandhya printed saree, designer bandhej saree, printed designer saree, new designer party wear saundarya saree, bandhej vol-07 designer saree and printed saree. We are offering Bandhej saree to our valuable customers while keeping in mind their demand. We offer product to meet the satisfaction of customers by our best product. Description: This Exclusive Saree Purple Color which give gorgeous look ,this designer saree embroidery work on in floral pattern.Saree is especially ready for any ceremony. Counted as one of the prominent organizations, we are engaged in providing a wide range of superior quality Printed Saree. The offered sarees are designed using premium quality fabric and latest technology in adherence with the set industry norms. The range of our sarees can also be availed in different customized designs, colors and sizes as per specifications of our clients. These sarees are perfect for daily wear as well as for special occasions. 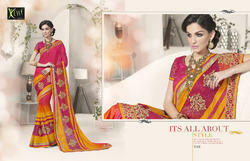 To retain our goodwill in clients' consideration, we are offering a qualitative collection of Red & Peach Half N Half Saree. This exclusive collection is well known in the market for featuring variegated attributes like marvelous colors, attractive designs and glossy finish. 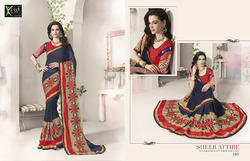 The offered saree is designed using superb quality fabric in compliance with the current market trends. Moreover, we rigorously check the entire collection on various parameters of quality. This beautiful Multicolor party wear Georgette Sarees will give an ethnic and traditional touch to the wearer with its gorgeous embroiderd work and design. This Embroidered Sarees is an ideal attire for all casual and social events where you want to look stylish and stay comfortable. The saree comes along with raw silk fabric unstitched blouse piece. 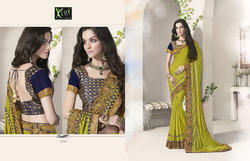 By keeping track of advanced market developments, we are offering a broad collection of Beige and Green Saree. 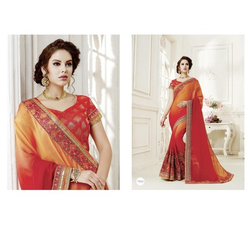 This saree is designed as per the specific preferences and demands of our valuable clients. We make use of the finest quality fabrics, threads and other material, under the guidance of our team of experts. This saree is available in different sizes, designs and colors as per specifications of our clients. In addition to this, prestigious clients can avail this saree from us at market leading price. Backed with leading–edge technology and experienced professionals, we are offering an extensive range of Designer Saree with Blouse that are designed using latest tools and modern techniques. Our entire product range is elegantly designed and highly appreciated by our clients for its comfortableness and durability. With the assistance of skilled and experienced designers using premium quality fabric, we are able to design these blouses in compliance with the latest fashion trades. Our popularity in this industry can profoundly be attributed to our range of Georgette Half N Half Saree. To fulfill the diverse requirements of our prestigious clients, we provide this saree in various colors, patterns and sizes. Further, we tailored this saree using high grade fabric and modern machinery with the assistance of our skilled professionals. Apart from this, we are offering the entire range of saree at the most economical price. Description: This Exclusive Saree is made of Georgette Fabric in Pink and Brown which give an gorgeous look ,this designer saree embroidery work on in floral pattern. Description: This Exclusive Saree is made of Georgette Fabric in Brown and Beige which give an gorgeous look ,this designer halfsaree embroidery work on in floral pattern. Description: This Exclusive Saree Pink and Grey Color which give gorgeous look ,this designer saree embroidery work on in floral pattern.Saree is especially ready for any ceremony. Description: This Exclusive Saree Green and Yellow Color which give gorgeous look ,this designer saree embroidery work on in floral pattern.Saree is especially ready for any ceremony. We are a reputed name in this industry, engaged in offering an array of Georgette Half Saree that is available in various colors, designs and patterns. Our offered saree is highly appreciated by our clients for their attractive colors and elegant designs. 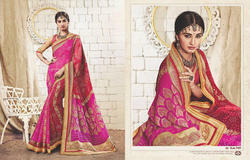 This saree is designed by our skilled professionals using best quality fabric and progressive technology. Our saree is tested on various parameters in order to deliver defect free range at clients' end. 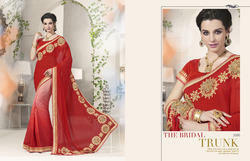 Apart from this, our prestigious clients can avail the offered saree at the most competitive prices. Description: This Exclusive Saree is made of Georgette Fabric in Red and Beige which give an gorgeous look ,this designer halfsaree embroidery work on in floral pattern. Keeping in mind the diverse requirements of our esteemed clients, we are offering a designer range of Chiffon Designer Saree. The offered designer saree is designed using best in class fabrics by our experienced workforce in observance with ongoing fashion trends. We offer this designer saree in diverse colors, and patterns as per the choice of customers. Our valuable clients can easily purchase the designer saree from us in a confine time at affordable rates.